This medication is used to treat certain serious eye conditions (such as age-related macular degeneration, macular edema, diabetic retinopathy). It is used to help prevent decreased vision and blindness. Ranibizumab works by slowing the growth of abnormal new blood vessels in the eye and decreasing leakage from these blood vessels. Read the Patient Information Leaflet if available from your pharmacist before you start receiving ranibizumab and each time you get a refill. If you have any questions, ask your doctor or pharmacist. 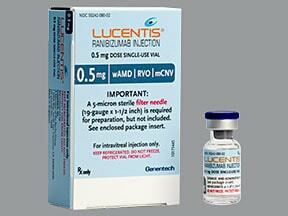 This medication is given by injection into the affected eye(s) by a health care professional. The affected eye is numbed before each injection. Your eye will be monitored before the injection. After the injection, you will remain in the doctor's office for a while, and your eye will continue to be monitored. The dosage is based on your medical condition and response to treatment. This medication is given as directed by your doctor, usually once a month for most conditions. When treating age-related macular degeneration, if you are not able to have monthly injections after your first few doses, getting injections once every 2 or 3 months may be an option, although not as effective as monthly injections. Consult your doctor for more details. 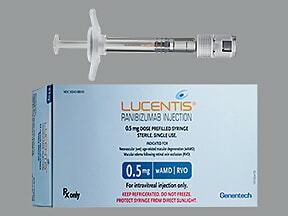 What conditions does Lucentis Vial treat? Mild discomfort and increased tears may occur in the affected eye(s). Feeling of spinning and dizziness may also occur. If any of these effects persist or worsen, tell your doctor or pharmacist promptly. This medication may rarely increase your risk for developing a certain serious eye condition (endophthalmitis), especially during the first week after receiving a dose. Tell your doctor right away if you notice any of these symptoms in the affected eye(s): pain, redness, sensitivity to light, sudden change in vision. This medication may sometimes increase the risk of serious (possibly fatal) blood clots. This may lead to stroke, heart attack, and other blood vessel problems. Get medical help right away if you develop: symptoms of stroke (such as weakness on one side of the body, slurred speech, sudden vision changes, confusion), symptoms of a heart attack (such as chest/jaw/left arm pain). List Lucentis Vial side effects by likelihood and severity. Before receiving ranibizumab, tell your doctor or pharmacist if you are allergic to it; or if you have any other allergies. This product may contain inactive ingredients, which can cause allergic reactions or other problems. Talk to your pharmacist for more details. Before using this medication, tell your doctor or pharmacist your medical history, especially of: a current eye infection, stroke. It is not known whether this drug passes into breast milk. However, this medication is unlikely to pass into breast milk. Consult your doctor before breast-feeding. What should I know regarding pregnancy, nursing and administering Lucentis Vial to children or the elderly? Your doctor will schedule periodic eye exams to monitor your progress and check for side effects. Not applicable. This medication is given in a clinic or doctor's office and will not be stored at home.Information last revised April 2017. Copyright(c) 2017 First Databank, Inc.
Are you taking Lucentis Vial? 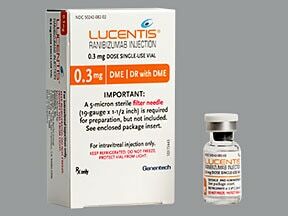 Are you considering switching to Lucentis Vial? How long have you been taking Lucentis Vial?